Photoshop gets a bad rap. So-called ‘serious’ photographers disdain its very existence. They think anyone using it must be sub-par as a photographic artist. My first class for my Master’s degree was a History of Photography class. In it I learned an astounding truth — photographic manipulation has been practiced since the beginning of the medium! The phrases “dodging” and “burning” quoted by Ansel Adams above refer to the conscious lightening or darkening of particular parts of an image as it’s being printed in a darkroom. But it goes way beyond that! The first photograph was captured in 1826. The first glass negative enabling multiple copies were created in 1851. Almost immediately those negatives were being combined to create ‘manipulated’ pictures. It is nigh impossible (even with today’s equipment) to get a properly exposed landscape shot without sacrificing detail in the sky – particularly if it is high overcast. An image just isn’t as compelling if there a plain, overexposed sky. Wouldn’t it be better to combine a picture of dramatic clouds with a picture of an interesting foreground? 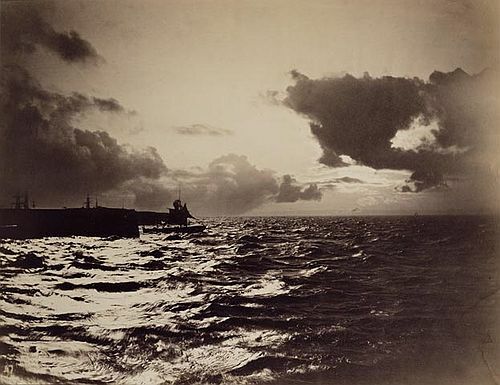 Here it is done masterfully by Gustave Le Gray, a French photographer in 1857. The sky is taken from one picture and the water from another. They were combined in the darkroom. “Well, that’s not that bad,” you say. In 1858, Henry Robinson created a composite image titled “Fading Away.” The image shows a young woman on her deathbed accompanied by grieving family members in various poses. He made this picture by combining 5 separate negatives. Okay, let’s take it one step further. What about a complete construction of a scene whose end bears no resemblance to the reality of the actual location. … That couldn’t be done without Photoshop … could it? If that was ‘very simple,’ the implication is that this type of work was commonly executed by experienced photographic artists of the day. I will be doing some shooting for a dance company later this spring and the pictures I take will need to be printed as 8x10s. The problem is that the format for a 35mm camera (film or digital) takes pictures at a 3:2 ratio. Taken at that ratio, a full sized print would be 8×12. What you see when you look through the viewfinder is a 3:2 ratio. Basically, if your print is 3” long, it’ll be 2” wide. 6” long, 4” wide. 9” long, 6” wide and so on. So, if you’re wanting to print a 4×6 print there is no trouble. However, if you move toward a larger print – 5×7 or 8×10 – you will absolutely lose some of your picture. That is BAD if you happen to fill your frame with your subject. As I said above, a 3:2 ratio would give you a 12×8 (or 8×12) size print. If you print it as an 8×10 you are losing a full TWO INCHES off the width or height of your picture. You can imagine how disappointing that can be when you go to enlarge that fantastic picture of your kid, or dog or whatever! So, how do you compensate for that? That’s what I spent a few hours looking into today. However, short of spending over $100 for a special focusing screen that shows you a 8×10 gridline, there is nothing to do but estimate. Leave yourself a little room around your subject. With the size of today’s files (megabytes) you won’t have any trouble cropping in a bit if you don’t use the full picture after all. But there is no way to ADD room around your subject once the picture is taken. When in doubt, go slightly wider than you think you might need to. One last word of advice – when you go to get your images printed ALWAYS, ALWAYS, ALWAYS preview them before you okay the order. Look at each and every one of them. Sometimes even 4×6’s can be slightly cropped. YOU want to be in control of what gets cropped out of your own prints. This is a good YouTube tutorial on printing 8x10s even with a 3:2 ratio. It leaves a white border around the print, but at least you don’t lose any of that great shot! If you want to photograph a man spinning, give some thought to why he spins. Understanding for a photographer is as important as the equipment he uses. To capture the essence of a location, a person, an event or a moment, you must give of yourself. It reminds me of the idea that some cultures don’t like getting their picture taken as it could steal their soul… I believe that you cannot take a truly meaningful picture unless you GIVE a bit of your soul. Only in that way will your pictures reflect an emotional attachment that draws people to it. Otherwise your pictures are simply snapshots – easily viewed and easily forgotten. So, next time you begin to push that button, ask yourself if you have given any thought, time or attention to your subject. If not, stop, draw a breath and do so. Then – shoot away! I plan to share some of my favorite photography quotes with you on the days I don’t have other content. My Facebook Fan Page has a daily photography quote, so you can check it out there as well. Welcome to the new 4A Photography WordPress website. This is my first post … more coming soon.